The perfect addition to any breakfast spread, featuring our mini bite-sized Shmearfuls and fruit salad and drinks for the group! What better way to start the day or enjoy anytime - Hot Fresh Cracked Egg Sandwiches delivered warm and delicious. 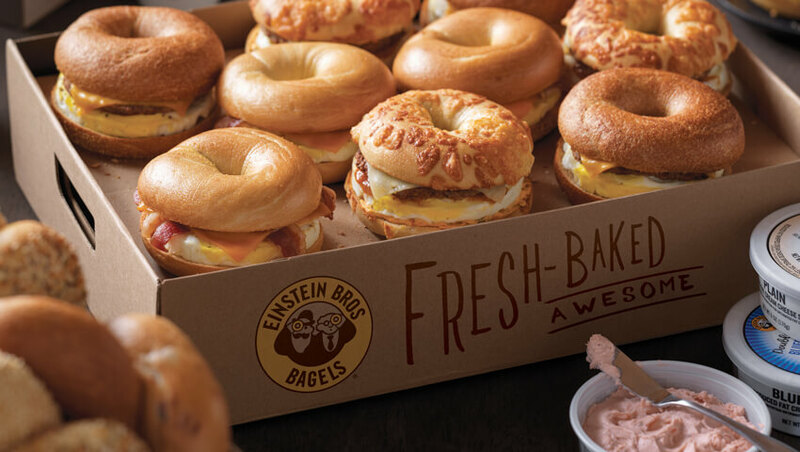 Enjoy our most popular Hot Fresh-Cracked Egg Sandwiches all served on plain bagels: Applewood Bacon & Cheddar, Turkey-Sausage & Cheddar, and Ham & Swiss. A selection of Hot Fresh-Cracked Egg Sandwiches just the way our chefs imagined them. Choose from our premium sandwiches like The Farmhouse or the Chorizo Sunrise! Our featured Thintastic™ Egg Sandwiches offer the same great taste with fewer calories! Add another Fresh-Cracked Egg sandwich to your Nosh Box!